I have to admit that my response has changed significantly over the years, since studying Panjabi and White textbooks on the clinical biomechanics of the spine. In the past, I would constantly study the human frame and look for the most perfect position to recommend when sitting, standing, sleeping, etc. — the positions that would place the least amount of abnormal stress on the spine. The problem with looking at sitting in this way is that even the most perfect seated position is always problematic over an extended period of time. This has everything to do with the law of gravity combined with the stagnation of the body. When the body does not move for extended periods of times, it begins to exhibit problems. Humans were designed to move for survival: squat, stand, walk, run, and hang. Lack of movement was typically followed by illness or death. There was no other option. This is what we came from. Fast forward a few thousand years and now you have to be highly motivated to move — by either fear of poor health, bad aesthetic appearance, or, in rare cases among 1% of the human population, physical optimization. We were designed to move as little as possible and eat as much as possible to ensure survival, which worked well 10,000 years ago and not so much anymore. The body is also well-equipped to manage seasons of famine (fasting or severe caloric restriction) by burning its own fat stores (nutritional ketosis), but very poorly adapted to excess macronutrients (carbohydrates, proteins, and fats). Coming back to the chair, the most optimal sitting position is still a problem because you are sitting — no matter what you do. What is the solution? I have been speaking for several years on the woes of sitting, holding various talks in universities, businesses, grade schools, high schools, etc. My main point is that standing is not the solution, movement is the solution. The ideal workstation set-up provides a movement-rich environment. 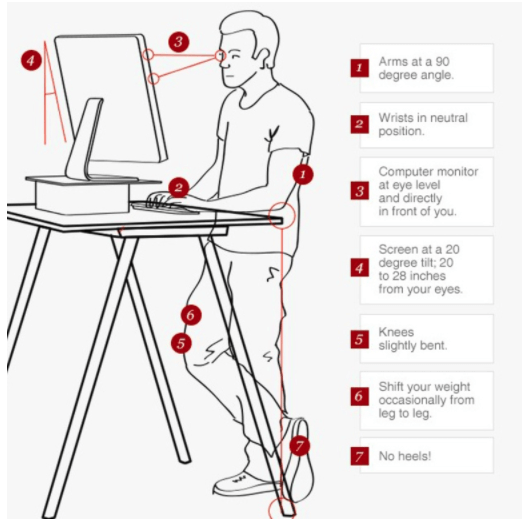 The environment should give the user an opportunity to sit, stand, lean, squat, lunge, etc. 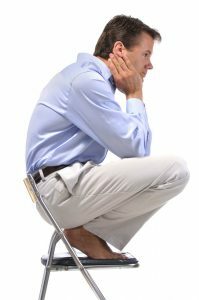 Your seat should actually be a rigid and stable chair that is level with the bottom of your buttocks, so it allows you to lean rather than sit as necessary. See an example here. Now that your environment allows for variety, set a timer that is not too annoying so you are reminded to switch positions every 15 minutes. A basic chair can also be use to squat on while working, or for placing the wobble disc and performing side to side, front to back, circular, or figure-of-eight movements. Having a chin up bar around to intermittently hang or do some pull-ups throughout your day will allow you to take advantage of gravity and stretch your upper body and decompress your spine. See my post on intermittent exercise for more information.